Refractive procedures surgically correct or reduce nearsightedness, farsightedness and astigmatism reducing or eliminating the need for corrective lenses such as eyeglasses and contact lenses. Light from an image passes through the clear part of the eye (cornea), the colored part of the eye (iris) and the lens, which focuses it upon the retina. The image is then carried through the optic nerve to the brain to create the image we see. Nearsightedness is the inability to see objects far away. When the cornea is too steep or the eye is too long, light rays are not in focus on the retina, resulting in blurred vision for distant objects. When the cornea is too flat or the eye is too short, light rays from distant objects fall behind the retina and are blurred. Farsighted individuals need glasses to see up close. Although distant objects appear clear, Past the age of 40, eyeglass correction is usually required. Astigmatism occurs when the shape of the eye is not round. If the cornea or the eye is oval in shape (more like a football than a basketball), then light rays are not in focus at one point on the retina. Individuals with astigmatism squint in bright light and require eyeglasses or contact lenses for clear vision. Presbyopia occurs when the lens cannot focus on objects up close. As we age, the lens inside the eye increases in size. Past the age of 40, most individuals do not have enough room within their eye to allow the lens to change shape and focus on near objects. As a result, reading glasses are required for near vision. The goal of vision correction procedures is to reduce or eliminate the need for corrective lenses, such as eyeglasses or contact lenses. Most people can see 20/40 or better following these procedures (able to pass a driver's vision test without glasses), and the majority can see between 20/20 and 20/25! Patients over the age of 40 may still require reading glasses for close work. Individual results may vary, and some individuals may still require eyeglasses following the procedure for some needs. These procedures are performed in our laser facility as an outpatient. Typically, one day off of work or school is all that is required on the day the procedure is performed. You will be seen the following day in the office and may then return to normal activities. There are no bandages and usually there is no pain with the procedure. The excimer laser is the most recent advance in the surgical correction of nearsightedness, farsightedness and astigmatism. 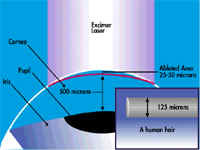 This particular wavelength of laser light is capable of removing microscopic layers of the cornea, typically one-third the thickness of a human hair, to reshape the outer surface of the eye. The actual application of the laser is usually less than 30 seconds per eye for most people. The laser refractive procedures are not painful and recovery is quite rapid. The procedure will not wear off and does not need to be repeated. Hear what people are SEEING after LASIK! 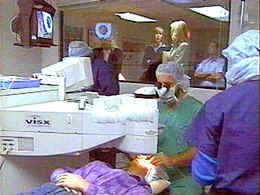 LASIK is the most recent advance in the use of the excimer laser for vision correction procedures. A microkeratome is used to create a very thin flap of the corneal surface. 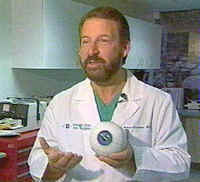 Dr. Kershner lifts the flap and the computer applies the laser beam to reshape the cornea. The flap is then repositioned back onto the reshaped cornea. 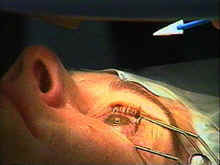 In this way, the eye acts as its own bandage and by performing the procedure under the flap instead of on top of the corneal surface such as in PRK, the risk of scarring is minimized, there is little if any discomfort, and vision is restored much more quickly, usually in hours rather than in days. Want to view the results of people who recently had LASIK with Dr. Kershner? Click Here. The ICL is presently under FDA investigational study. Unlike laser refractive procedures, which alter the surface of the cornea, the ICL is implanted inside the eye. Much in the same way in which a contact lens floats on the cornea to correct vision, the ICL floats on a film of aqueous behind the iris, in front of the natural lens, to focus light. The ICL can correct nearsightedness, farsightedness and astigmatism. Implantation of the ICL is a surgical procedure. 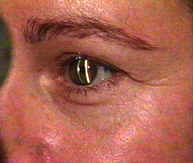 Because the lens is implanted within the eye, the eye is otherwise not changed, and the procedure is reversible. 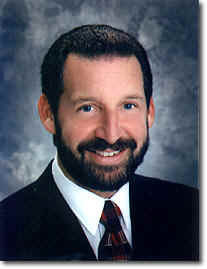 Robert M. Kershner, M.D., F.A.C.S., A.B.E.S. Dr. Kershner is a graduate of Boston University and received his Masters of Science and Doctor of Medicine degrees with honors at the University of Vermont College of Medicine. He interned in general surgery and obtained specialty training in ophthalmology at the University of Arizona Health Sciences Center in Tucson. He was Chief Resident of Ophthalmology and is Clinical Professor at the University of Utah Medical Center in Salt Lake City. Dr. Kershner has authored over two hundred scientific articles and twelve textbooks on eye microsurgery and lectures internationally on eye microsurgery. Dr. Kershner has performed thousands of refractive vision correction procedures in Tucson since 1981. Dr. Kershner is certified by the American Board of Ophthalmology, is a Member of the Board of the American College of Eye Surgeons and is a Fellow of the American College of Surgeons.